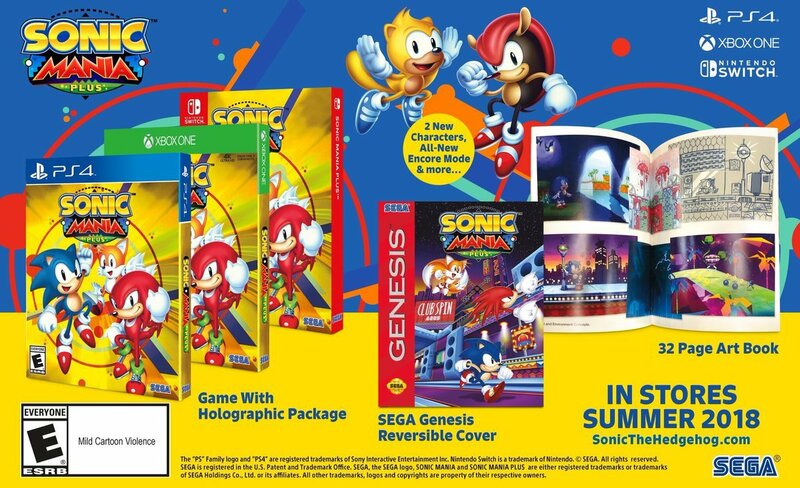 Announced during the SXSW Gaming live broadcast, one of the most requested physical editions of last year will finally become a reality during Summer 2018: Sonic Mania Plus will be available on the Nintendo Switch featuring extra content. 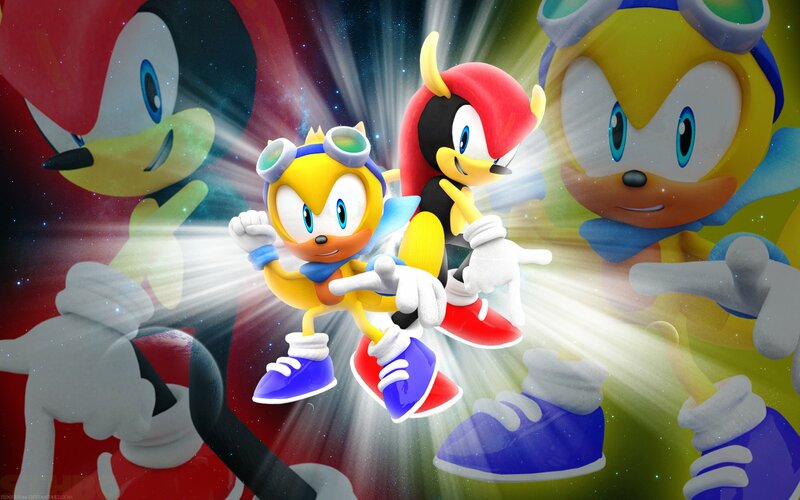 Two new playable characters join in the existing crew: Mighty and Ray. There will be an all-new 'encore Mode' that wasn't detailed at this presentation and an expanded four-player competitive mode. The package also comes with a lenticular slip cover, a reversible Genesis/Mega Drive sleeve plus an exclusive 32-page art book. Not too shabby for a $30.00/€30.00 retail price. 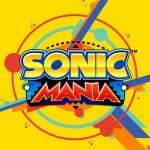 If you've already bought a digital version of Sonic Mania on Switch, an Encore DLC pack will be available for sale to access the new features. More details will follow at a later date. The series will also expand into a free five-episode cartoon featuring new music from the game's composer Tee Lopes. You will be able to watch Sonic Mania Adventures on Sega's YouTube and other social media channels. Will you be picking up this new retail option? I was at the panel, and the hype was real. It's great that Mighty and Ray are coming back to the games for the first time in years. Nobody saw this coming. I already have Mania digitally, but I'll likely pick up the physical version instead of updating the digital version (they said pricing for the Plus content in the digital version will be discussed at a later date) because the goodies that come with the physical version look so good. @OdnetninAges Likewise. The game is far to good to keep only in its digital form, I want a box to remind me of the game that clearly showcase what true Sonic games are all about. I might double dip for the physical version and just delete the digital for storage space. Does anyone know if this is a limited edition or not? This is a real nice set with the book and the Genesis cover art is a sweet addition. Really regret buying this digtal. I really wish you could "gift" digital versions to other people. I’m all over this. So glad I waited. Patience is rewarded. I shall be definitely be snapping up a copy. Nice that the DLC will be free for digital owners. Cool that there's finally going to be a physical but there really should've been one at launch. No double dip for me. One copy of a game per system for me. I. Can’t. Wait. I hope the animation comes to blu ray at some point. Got the statue, the ost vinyl. This will complete my glorious collection of my new favorite game. Now I'm glad I held off on buying this game. Great price too. I wish they did this in the first place, instead of that crappy collector's edition that had a gigantic statue of Sonic on a Mega Drive (useless) and a few other bits and bobs...with a download code. Glad the content is being added to the downloaded version for free. Hopefully they make the art book available to buy separately because I don't want to buy the game all over again just for that. All these digital-only getting physical releases afterwards is really starting to make me question whether or not I should still keep buying games digitally because I really just want to get stuff physically as much as I can. Uuuuuuuuuuugh. Can I get a refund on the digital so I can get this physical please? I am glad i held off on the digital release! Looking forward to adding this to my collection! @Yosher This, really. I'm very close to swearing off digital. Indies, I get that more about digital sales making a physical later....but Sega? They could, and should, have done this right from the start instead of that monstrous thing they did release. I was planning on getting Mania on Switch eventually, rather than getting a second PS4 controller (Mania is the only multiplayer game I have for that system). Glad I waited this long, cos now I don't have to download it! 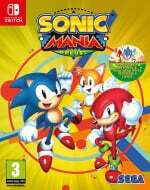 Wow, I'd been nail-biting on whether to pick up Sonic Mania for a while as I believe that NO console is complete without Sonic the Hedgehog (well, accept the SNES & NES maybe). For £30 physical, how could I resist? Now if they made the 5 part cartoon a continuation of Sonic SATam it would be perfect. @subpopz considering how bad most sonic games sell i am surprised they do physical for sonic games. A free update that expands the game for exisiting owners? My goodness! You just got me to buy it physically too, SEGA and company. Bravo to you all. @edgedino To be fair, most Sonic game recently have been pretty bad. I think out of the last 10 games it's pretty much just Colors, Generations & Mania in the good pile right? How is news that came out yesterday old news? The hell kind of logic? Did they confirm the new content was free to existing owners? Old news, I may wait to buy the whole package digitally once this drops, though. Sorry to be "that guy" but they didn't state that the extra stuff would be free at the event/stream, they said that it would be available as DLC and that pricing would be anounced later. The clip is available on Youtube, rewatch it to confirm. They were purposely unclear on pricing, maybe to feel out the market. I have seen MANY people assuming it would be free, but no confirmation from Sega either way. Unless they have since clarified or updated and I've missed it. Will be happy to be proved wrong. Awesome. Always liked Mighty the Armadillo. Nice to see him back. And I'm definitely going for the physical release. Even though I own it digitally already on Xbox. I would love the physical cartridge for my switch. Even though I bought the digital switch version, I’m So glad I held off on the other 2. Now the goal is to eventually grab the physical copies for all 3 consoles!! I have bought the collectors edition for Switch, and the download versions for PC and PS4. And I will definitely be buying the physical copies of "plus" for PS4 and probably Switch. Its one of my favourite games of last year and its been killing me not having a physical release on my shelf. Is the extra content worth me buying again for £30 each? Probably not, and I wish it had been available as physical retail from the start, but oh well, I'm glad its finally got a proper release. I'm glad from Mighty and Ray returning from the amazing and often overlooked Sega Sonic arcade game. Also, I like team Chaotix so glad to see any of the characters get used again. Is it just me though, or wouldn't others have expected Amy Rose as playable, and at least one new original stage added? Seems a shame to limit it to leave Amy out (she felt weirdly absent from the original imo) and a missed opportunity not to add another stage as DLC. I'd happily pay for extra stages. I have no prior knowledge of these characters but I won’t complain about free new content! Already have it digital on Switch, if I wanna double dip I could get for one of the other consoles that I have. Something for me to think about. @subpopz Meh they probably were not sure how it would be received and played it safe. It's one thing to shove out a crap 3D sonic, it's another to shove out a crap 2D one. @link3710 Hmm, I think I had my chronology out of order as I was sure Sonic '06 and Boom would have made the last 10. However, your list does show how hit & miss Sonic can be. @DanteSolablood I think he was counting the Boom games as spinoffs and therefore not core games. Personally I would say I've really enjoyed Sonic Colors, Generations and Lost World, and of course Mania. Both All-Stars Racing games were top notch too. I've bought Forces but not had a chance to try it yet, I have a big backlog, but it looks ok, not completely terrible. As for older games, I enjoyed Unleashed, Heroes and SA 1&2, the Rush, Rivals and Advance series, on top of the obvious 8 and 16bit classics. Only '06 and the 2 early Wii exclusives were completely awful, imho. This one is a good throwback to classic Sonic. But, I mean they put out that giant Genesis super edition of it....why that and not a regular physical? Good, I hope they give the 3d Sonic's a rest for a while. This is what Sega should be focusing on. I have held off buying this one, in hopes of a physical release. I am glad I waited! Wow, yes please. Now I'm glad I didn't buy digital. @Shiryu - With Forces right next to it on my shelf, it will be the good and the bad in one year. Now all we need is the ugly. Own it on Steam already but I'm still getting the physical Switch version! A free update for those who already own it? Not bad at all. But because of Deviantart, new Sonic characters forever make me cringe. I always wanted the physical version of the game but passed on it because the only version available was the collectors version with the statue, but which cost like $80 for a a $20 game and I just couldnt justify it. Despite the dlc maybe being free, I want that lenticular case and physical copy of the game.. I'll probably double-dip for this one. Although extra characters dont actually interest me that much tbh. Kind of annoyed I can't seem to find a preorder available anywhere. @Malcrash 06's soundtrack is flawless, Forces only has one good track and it's the Westopolis remix. I do like other tracks but for Sonic I found most to be unfitting. This should be the ideal way for me to jump on, but only for the physical release. I'd rather have Amy & Vector than Mighty & Ray. So is there actually new levels? If not, I don't think I'll bother. Already have it on Steam. @link3710 If you liked Secret Rings, you'll definitely enjoy Black Knight. @Heavyarms55: @Kimyonaakuma: - Apparently, a quick Google search reveals the characters are Mighty the Armadillo and Ray the Flying Squirrel from an "obscure" Sonic arcade game, also apparently from 1993. @Everyone_Else: So, is this package gonna contain an incomplete physical, that gets dlc added on, or a complete cart? Free for existing digital owners, huh? Awesome. I've been playing this game a bit recently so this will certainly be welcome. So happy I never bought the digital version of this. Well this is the news I've been looking for in the past months! This game definitely deserves a physical release. This should had been physical from day one but I'll gladly rebuy it again just to get it physical on the Switch. Would be interesting to try Mighty and Ray on console for the first time. @TheLobster Preorders should be opening Monday or sometime during the week. And THIS is the VERY reason that I never bought it digitally. Due its consistent positive reviews and popularity, there just wasn't a question in my mind that this would eventually make it to a physical release. Damn it, there goes more money. Need this even though I bought the special edition. I wish game devs would stop doing this, just bring out the physical version at the same time! If I got the physical edition, would my save from the digital edition work? I know Switch is a little weird about such things. Regardless, I'm pleased that they're updating the game. It was among my favorites of 2017 - curious about Encore Mode. I don’t want the physical, but would’ve bought the extra content as DLC, only to read that it’ll be free. Thumbs up SEGA! Not too shabby for a $30.00/€30.00 retail price. All the extra content will be provided for free to existing digital version owners. Guys, hold on! They never said the update gonna be free. They said that they will announce the pricing later. I don't know why every news site got that wrong. I joked about this in the last Nindies article and lo and behold. It frustrates me as you need good digital sales to ensure a retail sale would be a success, but that leaves the original supporters of the game hard done by if they were to prefer the retail version. If everyone waited, this would never have happened. Of course, people bought it digital in their droves and now have to consider whether the retail is worth double dipping. Frustrating. I feel okay with the digital. The art book seems cool, but would just sit on a shelf. Now if they'd release an actual Genesis cart with game I'd have to be all over that. So the physical is cool. I'm hesitant about the two characters, as any time Sega adds more characters to Sonic I get nervous. The staff has the weekends off. Despite that, I ended up covering SxSW stream live and wrote these two articles on the spot. However and even if I had the authority to publish these I would not because English is not my primary language and these needed proofing. I already have it digitally but do not mind double dipping to show my support for this brand of sonic. Here's hoping the Mania series becomes the main Sonic while green eyes can stick to racing. Two Sonics from different timelines has gotten incredibly stale. The art of the double dip...screw you SEGA....when can I preorder? Already own digitally but will buy this. Whether I keep this sealed and digitally upgrade is another question. Looks like I'm double dipping! I can't believe how many digital games are getting physical releases! I love it =) I waited for Wonder Boy and Rocket League and now I wish I had of waited for Mania! I hope games like Stardew Valley and Celeste get physical releases, too. @Capt_N Mighty was also a playable character in Knuckles' Chaotix on the 32x. Glad I held off buying the digital. I've been wanting to play it so bad but as a sonic fan I kinda wanted a physical version. Most games are just fine as digital but some I just need to have on the shelf. The artbook is also a nice bonus. Now to just decide if it's ps4 or switch version for me. Switch might win for the portability, but if it's the normal 15 euros more, then I'll get the ps4 version. If someone complaint about free content... On my side, its s great news!! @Heavyarms55: I had no idea who the characters were, which is why I did the Google search. I apologize if my comment came across as if I was calling you lazy for not searching the information yourself. @Markiemania95: I did not know that. Thank you for letting me know. @Everyone_Else: I kinda wish that all devs would get braver about releasing physical first, rather than digital-only, then physical copies. I understand for certain developers/publishers that lack the financial strength to do so. It's just that this can be/become a sneaky trend for developers/publishers, to first release a digital-only version of a game, then release a physical version that was planned, & financially viable all along. It's similar to Nintendo's practices with Tropical Freeze, or the price of some Virtual Console games. The games industry as a whole, knows gamers will go along with this practice, I think. @DanteSolablood Boom I didn't count as it's technically not part of the main series, nor developed by Sonic Team. Sonic 06 was... '06, while Rush Adventures was released in '08. We've been getting 1-2 Sonic main series games a year for a long time, and Sonic '06 is now 12 years old. Not a surprise it didn't make the recent 10. I think it's... probably about 14 or 15 back now. @subpopz save money incase it went bad. @DanteSolablood hard to say but ya pretty much. I know the Switch is region free, but the version in the picture is a US/Genesis version. Do we know if they will do a proper EU/Mega Drive version as well? I'm fine having these Indie games digitally on my Switch. I picked up Sonic a while ago and really enjoyed it, and to be honest none of those enhacements for the physical release make me feel like I missed out, so no regrets from this gamer. Although the flip sideof that is that I picked up Snake Pass when it was on sale a while ago and really couldn't get into it. But as a digital game I don't have the option of trading it in. Preorders are now LIVE on Amazon US. @Sinton MegaDrive box art for EU is confirmed. Watch the panel reveal on YouTube to see for yourself. Bring digital only really put me off. The time has finally come to hand SEGA my money! Mighty is cool. Amy would be cool. Not sure who Ray is. Haven't followed Sonic "lore" since the first 75 comics and the original Sat. AM cartoon, but it was actually pretty cool back then. @link3710 I get what you mean about Sonic Boom but it was touted as the future of Sonic in the run up to it's release - my guess is it's crushing failure was the only reason Sonic returned in-house for main series games from then on. It's a shame, the game had potential. The only reason I know of those characters' existence is because of the Archie comic book series I used to read as a kid. Oh, the memories. Normally I would be shouting "f*ck! I should've waited! ", but for 30 euros, and considering the digital one cost me 10 because I got it on the Russian eShop, and the game is so good, I don't mind double dipping for once and will think about it being a 30+10€ purchase. 40 is still good for this game. The only thing is they should've included an instruction booklet, because it does exist -they gave it away in some event- and the digitalized version proves it. Glad I didn't get around to buying Sonic Mania yet. I'm guessing as it's not a special edition they'll have plenty to go around so we won't be fighting for them. @Heavyarms55: Thanks! That's good to know! @Heavyarms55 You know that Mighty and Ray are not new, right? Mighty and Ray were in SegaSonic The Hedgehog which was a Japanese arcade game. Argh, doh, darn, grah, grp, hrm, darnit, darnit, darnit! ok, I've had my mini-meltdown. Despite already owning the digital copy and Sonic Statue... I will double dip into this physical release. ...i'm fine. really. I'm fine.